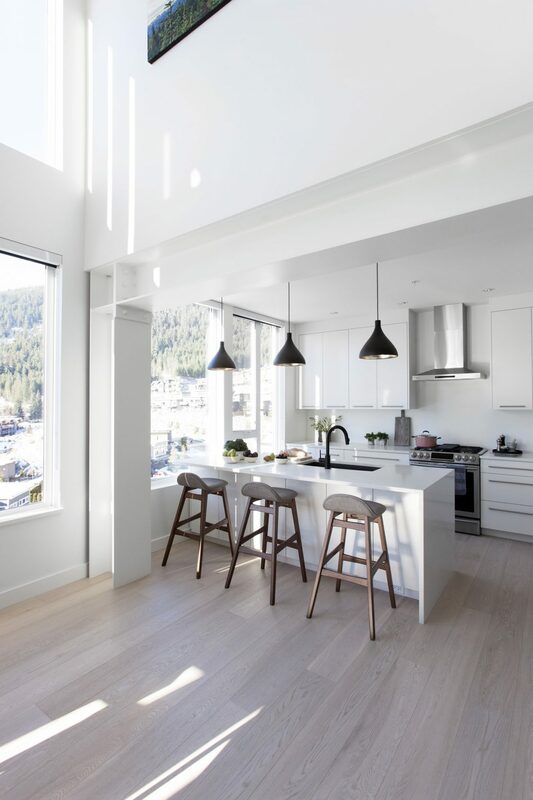 A vision in white often refers to a bride on her wedding day, but it is also the best way to describe this stunning Whistler home for a couple who eschewed the modern rustic look more typically adopted for mountain retreats. 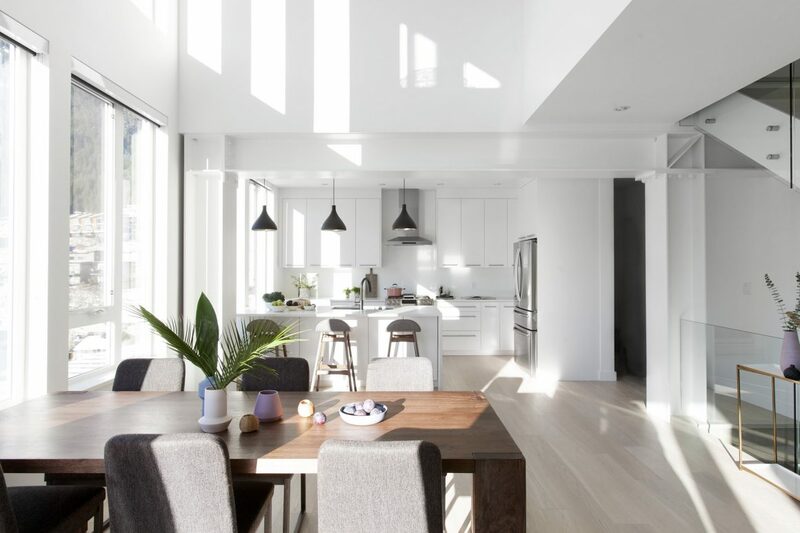 Bathed in natural light, the main living level of the home gets its warm ambience from the light oak floors, the mango wood dining table, and the warmest accent there can be: lots of sunlight streaming through two-storey-high windows. 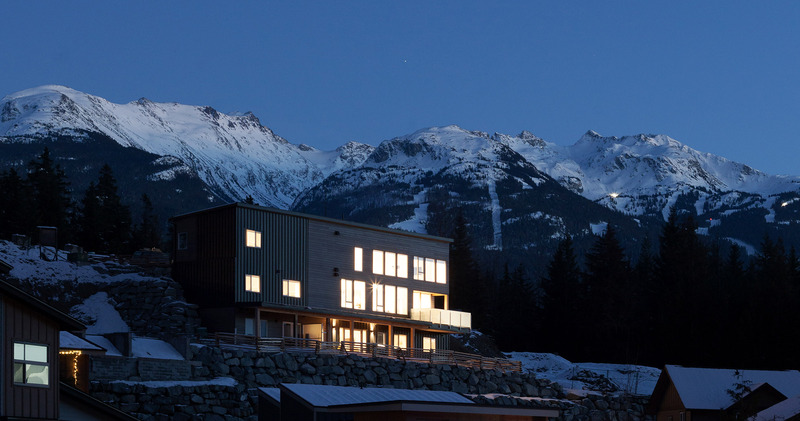 Tobias, however, is Swiss and grew up in one of those traditional chalets, which is what he envisioned for their Whistler retreat. 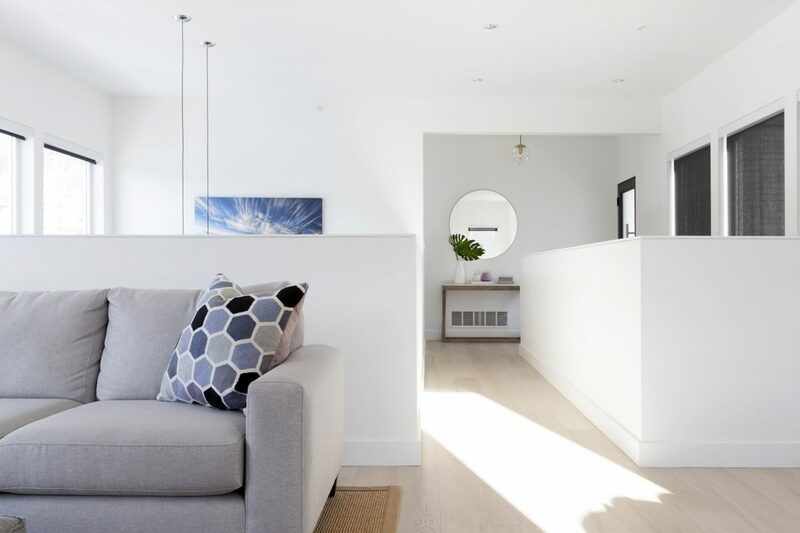 The result though is that there is nothing traditional about this sleek, multi-level home. It’s a sun-drenched contemporary haven with soaring windows that allow the mountains to be the perfect backdrop to the minimalist design. 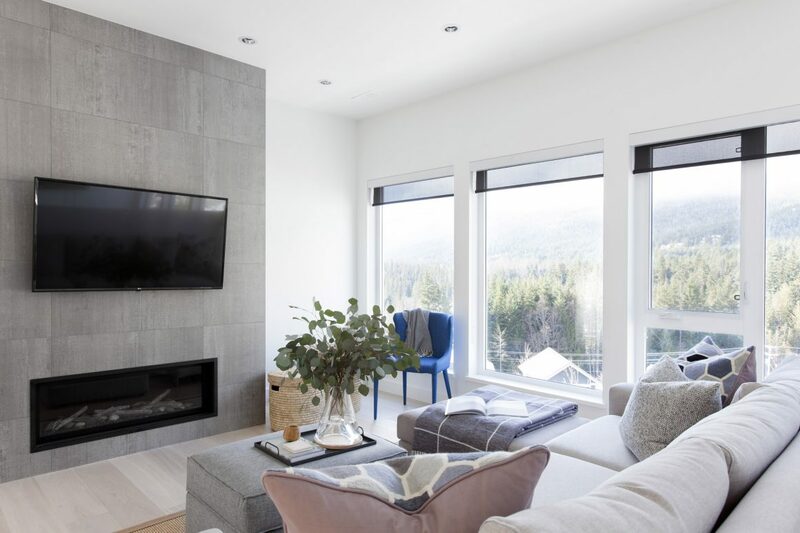 Not only is the design of the home contemporary, but the way in which it came together was, too: with few stores in the Whistler area, Sharryn ordered almost everything for the home online. The kitchen island was designed to seemingly flow out of the soaring windows. “The tile behind the TV and fireplace was straight out of a display at Julian Tile in Vancouver,” she says. That’s not to say this was an easy project. Architect David Arnott, of STARK Architecture, says the building lot’s 25-foot sheer drop proved to be very challenging from a construction point of view. The entrance to what Arnott describes as an “upside down” design is on the top level. It’s then downstairs to the main living quarters, where there is a bridge connecting to the family room, and then downstairs again to the bedrooms. 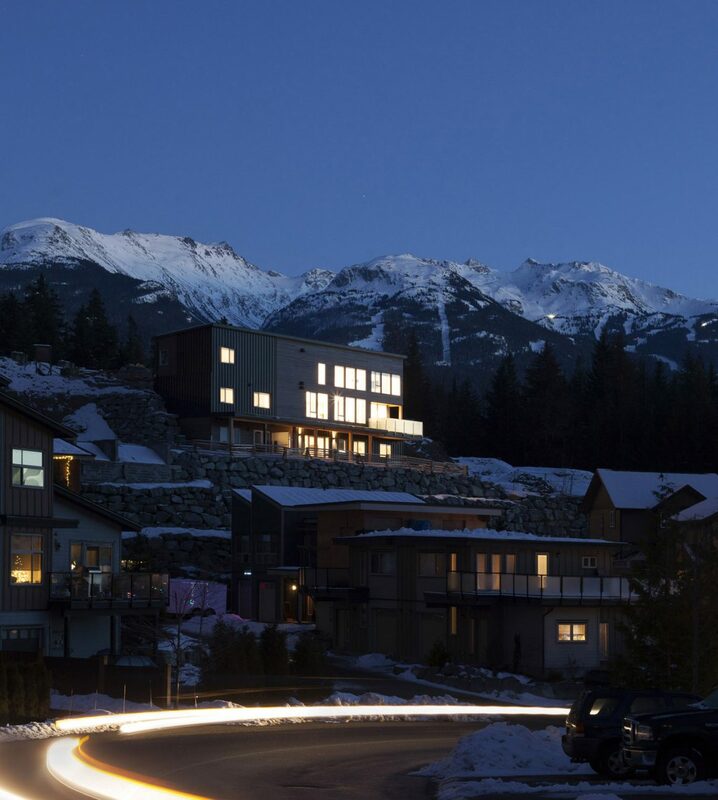 “Most lots in Whistler are sloped, but this one is particularly so,” he says. However, he loved the creative and intellectual challenge of having that kind of constraint, which forces an architect to be that much more inventive. So the house was constructed to be its own retaining wall, and then Arnott came up with a creative layout that he describes as “an upside down” home. 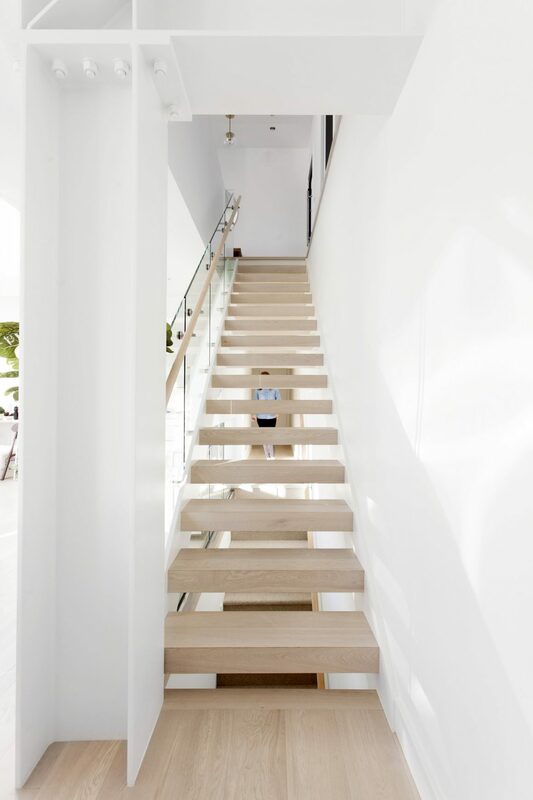 The entry is on the top level and it leads downstairs to the main living area and then down more stairs, to the ground floor, where the four bedrooms are kept cool in the summer and insulated in the winter. Homeowner Sharryn Gonzalez spotted the tile that surrounds the TV and fireplace in an online display and ordered it through the web, as she did with many of the home’s furnishings. She loves the warmth the taupe tiles bring to the family room. The unique design led to a mixture of single- and double-height spaces on the main floor, which are joined with interconnecting bridges, all doused in glorious mountain light and the reflection of the sparkling snow in winter. 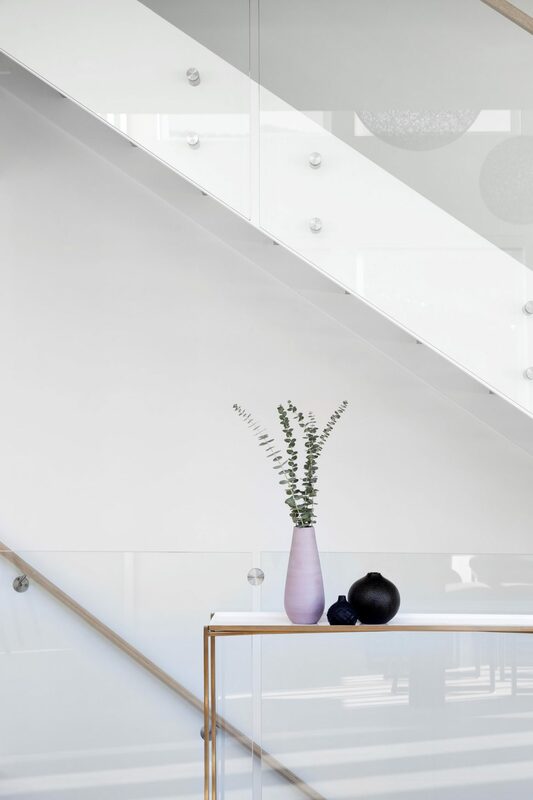 The contemporary-style staircase, with its open risers encased in glass, is a focal point that Sharryn believes contributed to the overall aesthetic of the house that she wanted. “It evolved and ended up even more modern than I anticipated,” she says. 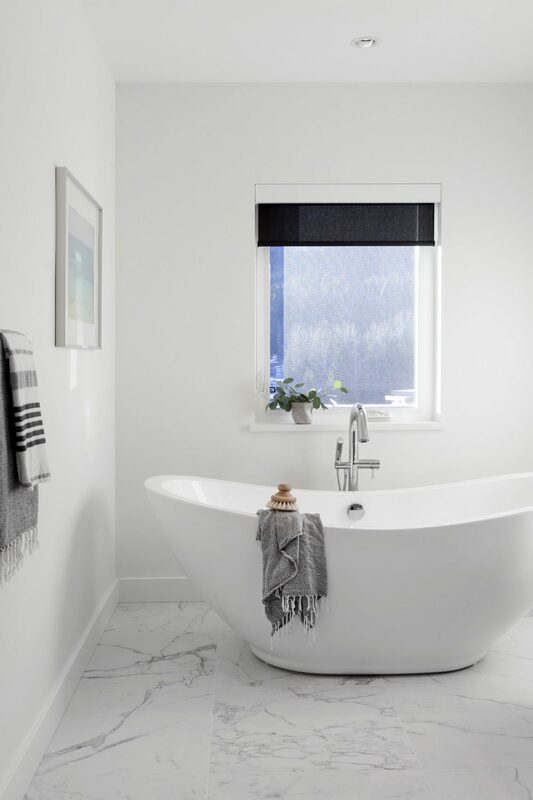 The space planning of the home was well-considered, according to Laura Melling, an interior designer who was a stylist for the project. “It’s definitely a more unexpected layout but it works really well,” she says. 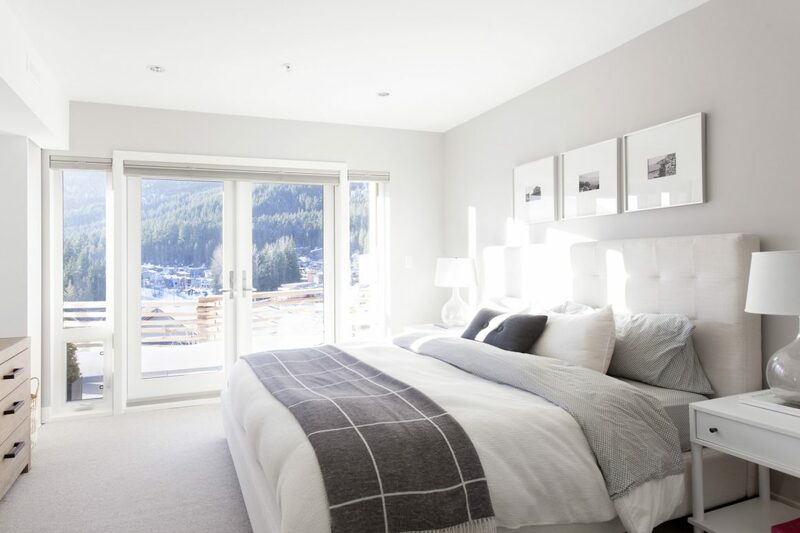 Arnott was especially pleased that he was able to provide a small yard for the children, and that a “mortgage helper” – a two-bedroom, three-storey suite available for rent – has proven to be lucrative for the couple in the pricey Whistler market. The stunning light oak staircase, all encased in specially engineered glass, was another challenge. “That was a great collaborative effort by us and the builder,” Arnott recalls. Imagine waking up to that view every day! 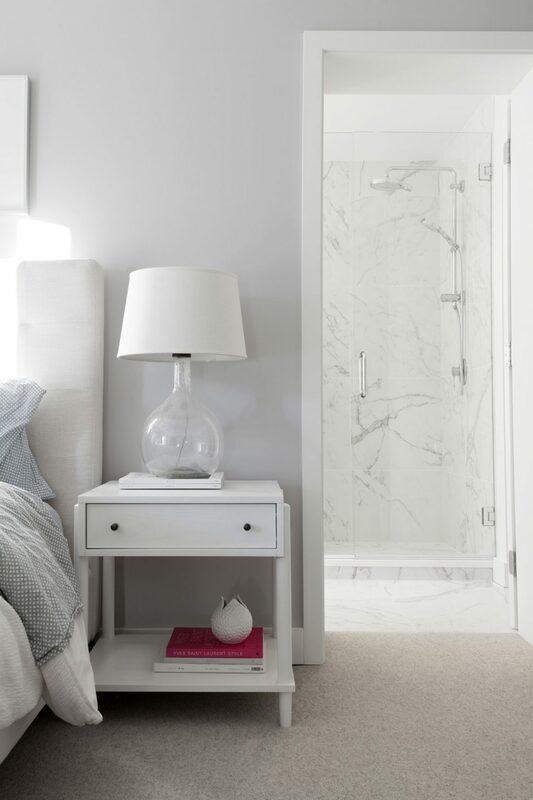 Sharryn says the master bedroom and ensuite are like an oasis of tranquility for her. All the glorious light in the home, she says, is made possible by electric blinds. The light, white, breezy feel of the house was accentuated with a few key furnishings that offer warmth and dramatic effect. 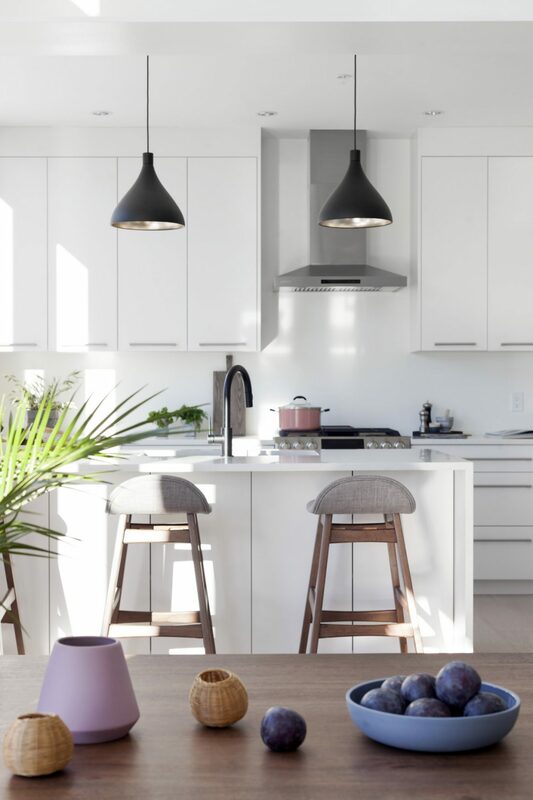 The mango wood dining table and stools, from CB2, help soften the whiteness of the cabinets and the white marble of the kitchen and dining areas. And the lacy orb light fixtures, highlighting a two-storey vaulted ceiling, bring contrast and flair to the open spaces and white walls. 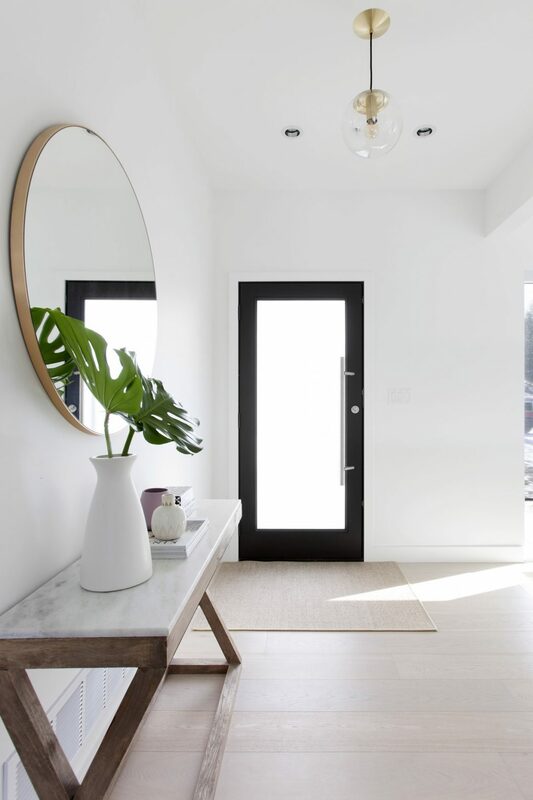 To tone down the white, Melling says, she “just brought in some textiles and greenery to balance it out.” The home, she adds, is minimalistic but not sparse. “It’s a very warm and inviting home, which has a lot of natural light that is gorgeous,” she says. For Sharryn, it was a labour of love with a steep learning curve. 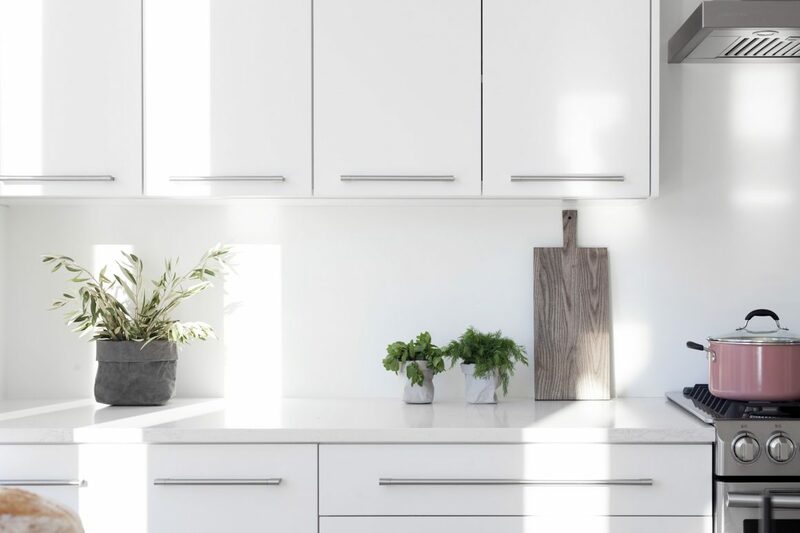 “We knew nothing about building a home when we started, so part of me wishes I could go back now that I know more,” she says. So is there something she would change?